I have been having a bit of a spring clean. Don’t get worried, I’m not turning into a Domestic Goddess, I have concentrated on my wardrobe and accessories. Gone are any summer clothes that didn’t make it out of the wardrobe during last year’s glorious sunshine. Ditto with winter clothes. I know we’re still in winter, but believe me if I was going to wear it I would have done so by now. I also pulled out all of the handbags that I own (believe me, they fill a cupboard by themselves!) and out went any that I didn’t like any more, and there were a fair few that I had forgotten I had! Out went scarves, gloves and hats that I no longer wore. The same with shoes – why do I keep shoes that I’ve discarded as uncomfortable? Even underwear was sorted, although I put that in the rag bag. Second hand underwear shouldn’t even be a thought inside anybody’s head. You would think I had oodles of wardrobe space now, wouldn’t you? If only!! At least everything fits in now there isn’t so much crammed inside. Now I need a trip to the charity shop. Next I attacked my dressing table. Gone are the half used products that didn’t suit my admittedly fussy skin, gone is any out of date make up, or make up that turned out not to suit me (why did I keep it in the first place?) My spare toiletries are stacked neatly in their basket, nail varnishes in their little storage case, spare make up sponges, cotton wool etc in a freebie make up bag. Yet more freebie make up bags went into the charity bag and the lovely ones which I have received as gifts are in a cupboard, ready for my next trip away. I even sorted the travel sized products which I use on holidays, chucked any old ones and made a list of those I need to replace. My humongous work bag was sorted, although I did that two weeks ago when I went back to work. How does it collect so much rubbish in a fortnight? I then sorted my other handbags. I generally use one of two – both vintage, one larger than the other. If I am going anywhere where I may need my Kindle I use the larger one. It will comfortably hold that along with my purse, card wallet, phone, keys, handkerchief sachet (yes, I own a handkerchief sachet, although it holds paper tissues as I don’t like carrying snot laden hankies around) and a tiny make up bag containing powder compact, lipstick, lip balm, hand cream, nail file and a comb. With the smaller handbag I have to pretend I am a Proper Lady and carry less. It is leather lined, with an internal zipped pocket, so I use that as a purse/card wallet and only carry phone, keys, hankies, lipstick and powder. Apparently that is all Proper Ladies used to carry (with the exception of the phone, of course!) which is why vintage handbags are so much smaller than the cabin trunks we haul around today. Really it’s no wonder almost every female of my acquaintance has some sort of back/neck/shoulder problem! So now my surroundings and possessions are sorted it is time to spring clean my waistline. 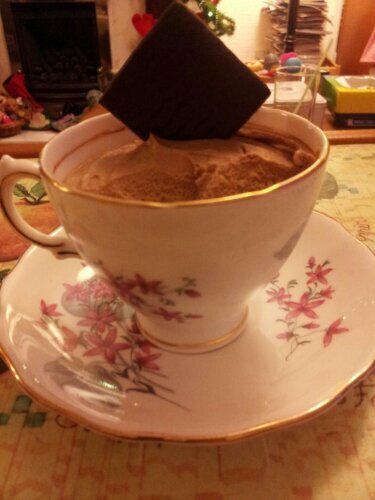 If only I could siphon off my excess flab and throw it in the bin! I have been very firmly told that I should blog more often as I have plenty to say, even when I think I don’t. So here I am. I also did a piece of creating that would give Mrs Moneypenny from Superscrimpers a real thrill. I have been looking for a footstool for ages, to make sitting on the sofa more comfortable and less likely to set off my neck and back pain, but all the ones within my budget were too high. I had been tidying up and was sat recovering, with my feet resting on my old Next Directory. It struck me that it was the perfect height…so I amalgamated the box from my new Directory with my old Directories, glued wadding (aka batting) all round it, with extra on the top for comfort. Then I stitched it into a fabric envelope and voila! 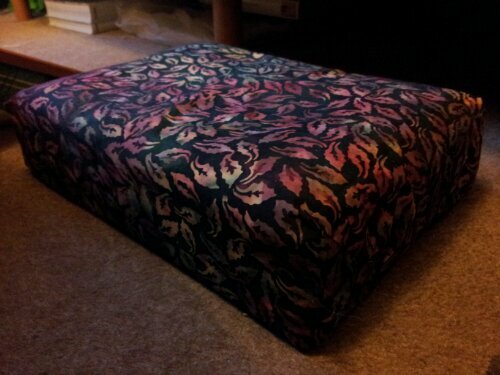 The perfect footstool and you would never know it was made out of old clothing catalogues. I will probably spend the rest of the month much as I have been doing, but we’ll see…..